This graph is from Wu et al. (2012) and published in the journal, Nature Climate Change. In this experiment the researchers were asking the question, what is the long-term response of plant-growth to a warmer climate. The authors make the point that the majority of experiments assess only short-term changes; however, due to feedbacks mechanisms within ecosystems initial and long-term responses may be different. Experimentally, plant-soil mesocosms (small experiment unit that bring in part of the natural environment under controlled conditions) were transplanted down a steep elevation gradient in northern Arizona to expose them to a warmer climate and collectors and interceptors (tools to remove or introduce water to simulate wetting or drying conditions) were used to induce changes in precipitation. A table from the original paper is included to show these gradients. In the included graph changes in Annual Net Primary Productivity (as percent increase when compared to controls**) are on the y-axis and time (years) on the x-axis***. 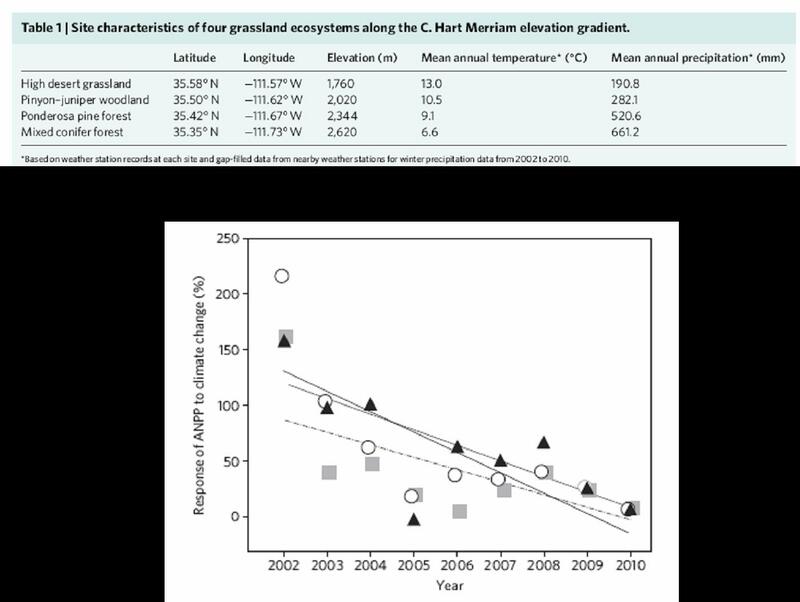 The take home message from this graph is that plant growth does indeed increase initially under a warmer climate; however, given more time this rate of change decreases progressively to such an extent that by the ninth year the difference was no longer significant. ***Different colors and shapes on the graph represent different treatments (e.g. warmer climate-ambient precipitation, warmer climate-increased precipitation). 1.What is the purpose of the transplanted control within the native climate? 2.Why is understanding short-term and long-term patterns and responses to global climate change important? 3.Student activity: Scientists are often asked to present data and testify in front of the United States Congress. Congressmen and congresswomen can then use these presentations and data to make new policies for the country. Using the above data from Wu et al. have students prepare a five minute presentation to Congress that explains these data and offers advise on how this study could inform new policy regarding climate change for the United States.